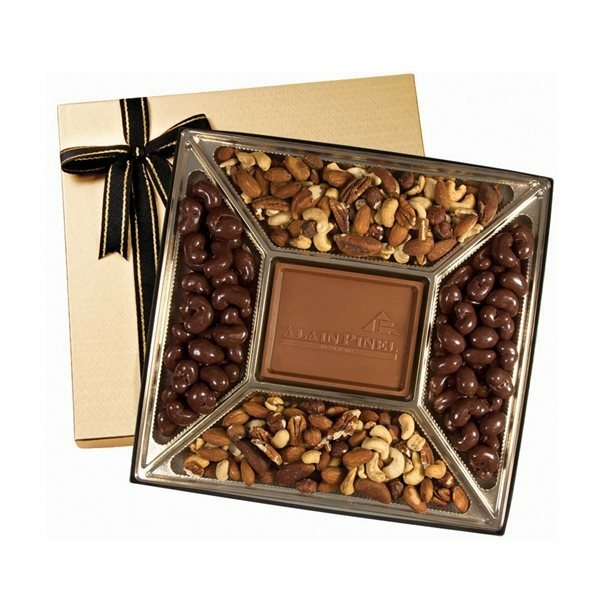 Whether you prefer cashews, pretzels, milk chocolate, dark chocolate, or all of the above, this gift box has it all! Our medium custom chocolate delights gift box contains 1 1/4 lbs. of tasty confections that will satisfy any sweet tooth! Surround your customized milk or dark chocolate centerpiece with 2 popular confections. Put this on display at a party and watch how fast it goes! The window box is available in gold or silver. Dimensions: 11 1/4" x 10 3/4".